Over the last decade, Hezbollah has reshaped security and political dynamics in Lebanon and the broader Middle East as part of the self-proclaimed “axis of resistance” that includes Iran, Syria, and Hamas. As a terrorist group, political party, and theological movement, Hezbollah has managed to unite disparate populations in an aggressive strategy that has coalesced into one of the most significant threats to the United States and Israel. 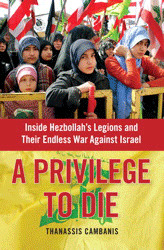 In his new book, A Privilege to Die: Inside Hezbollah’s Endless War Against Israel, veteran Middle East correspondent Thanassis Cambanis offers the first detailed look at the surprising cross section of people who are willing to die for this movement’s apocalyptic beliefs. Please join the Center for American Progress for a discussion on Hezbollah’s role in the Middle East, the challenge it poses to U.S. policy goals in the region, and the likelihood and potential fallout of another war with Israel. Elliott Abrams, who was the deputy national security advisor handling Middle East affairs in the George W. Bush administration, will offer commentary on the book and on Hezbollah’s evolving regional role and its impact on U.S. national security. A Privilege to Die: Inside Hezbollah’s Endless War Against Israel will be available for purchase at the event.